• Leases from June 1, 2017 through May 29, 2018. 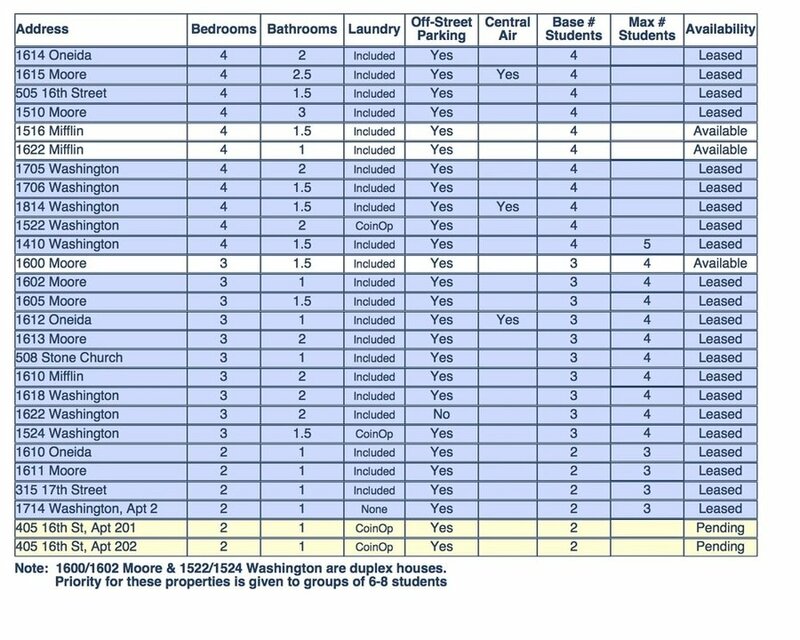 • Maximum number of students permitted per house/apartment is four (4) per Huntingdon Borough Zoning. • Utilities (electric/heat/water/sewer/trash), lawn care and snow removal included in rent. Cable TV and Internet not included. • No security deposits. $150/person move-in/move-out fee, non-refundable - due at lease signing. • June 2017 & May 2018 rent due on June 1, 2017. Remaining monthly payments due in advance; on or before the first of each month. ​• All properties are unfurnished but major appliances are provided. • No pets & no smoking. • A Student Information Form must be submitted by each individual at the lease signing.